In the early evening any night this time of year, the Big Dipper is standing on its bowl, and you can use the bowl to point to the twin galaxies, Messier 81 (Bode's Galaxy) and Messier 82 (the Cigar Galaxy). One of the commonest activities of amateur astronomers is observing the 110 deep sky objects originally catalogued by Charles Messier in the 18th century. Messier was one of the first astronomers to devote himself to hunting down comets, those icy visitors from the outer reaches of the solar system. To help his quest, he kept a log of "false comets," objects he came across in his searches that were not comets, but seemed to be permanent unmoving objects in the sky. The objects which Messier catalogued comprise the brightest and most beautiful of deep sky objects (DSOs): star clusters, nebulae, and galaxies. Messier had no understanding of their actual nature. All they were to him was a nuisance factor in his hunt for comets. They are also distributed widely across the sky, so that any amateur astronomer who tracks them all down becomes intimately familiar with the constellations. By and large the galaxies in Messier's catalog are the most challenging objects, but there are a few exceptions: bright galaxies easily seen with small telescopes of 60mm aperture and up. 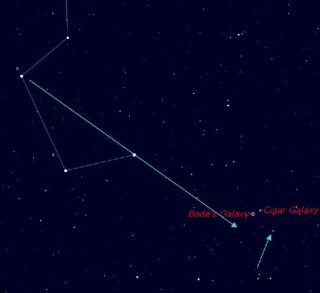 Two of the best are found close to the Big Dipper in the sky, and are known by the numbers 81 and 82 in Messier's catalog. The technique we will use to locate these galaxies is "starhopping," in which we navigate from a known pattern of stars to an unknown area. A program like Starry Night is an excellent tool for locating these objects among the foreground stars. Tonight's starhop starts with the most familiar asterism in the sky, the Big Dipper. At this time of year, the Big Dipper is located in the northeastern sky around 11 p.m. at night, and appears to be standing on its "dipper end" or "bowl end." Start by drawing an imaginary line diagonally across the shape formed by the four dipper stars, ignoring the handle. Draw this diagonal towards the "pouring lip" of the dipper, from upper left to lower right. If you project this line a distance equal to the diagonal across the dipper, you will be very close to the two galaxies we're looking for. If you sweep around with binoculars or a low-power eyepiece in your telescope, you should spot the two galaxies. They will be fainter than you expect, like tiny wisps of smoke. What usually happens with many people is that they overshoot their target and end up looking at a little isosceles triangle of stars, which you can see just below the galaxies in the accompanying image. All is not lost, because if you use the two stars on the short side of the triangle as pointers to return in the opposite direction, you will have a second try at picking up the two galaxies. Two tiny wisps of smoke, close enough together that you can probably just fit both of them in your low-power eyepiece. But take the time to examine them more carefully in a more powerful eyepiece, say around 100x. These two galaxies are remarkably different from each other. Messier 81, sometimes known as Bode's Galaxy, is a neat tidy ellipse: a tightly wound spiral galaxy tilted a bit to our line of sight, so it appears slightly elliptical. Messier 82 is nowhere near as tidy. Its outline is noticeably elongated compared to M81. It looks definitely cigar-shaped. For that reason, it is sometimes called the Cigar Galaxy. It is slightly easier to see in light polluted skies than its partner. When observed with large amateur telescopes, it appears to break up into knots of brighter and darker material, very odd looking indeed! Astrophysicists who have studied M82 say that it is one of the richest areas of star formation known. After you go to the trouble of finding elusive objects like these, you might try to make a simple sketch of their appearance. This doesn't have to be "artistic," but rather a record of what you saw. It's often easiest to draw this as a negative: black stars and grey galaxies on a white background.